Just a little reminder, One Hundred Wishes is closed while Hope and I finish up the last few details and get the new look all ready to be uploaded. I wanted to take the site off-line for a little longer so I could have a mini-break before the next phase of shop fun begins. This Thursday, the shop will reopen with a fresh new look, new logo, new colors and designs, new items and some fun giveaways! You will just have to check back for the details....I don't want to let the cat out of the bag just yet. We just got back from our trip, and boy was it nice to spend the long weekend relaxing and enjoying the company of family. My niece, Mallory, turned 1 and had a watermelon-themed birthday party that was too cute. She wore a sweet pink dress with embroidered watermelons along the neckline. There were watermelon balloons, bowls of watermelon taffy and other pink and green candies, watermelon cookies, watermelon cupcake picks, watermelon dishes, napkins, you name it! My sister-in-law has been planning the party for months, and it turned out to be a sweet event for Miss Mallory. And I just love a well-coordinated party! As always, my mom and I hit the local flea market, and I thought you might like to see some of the treasures I uncovered. 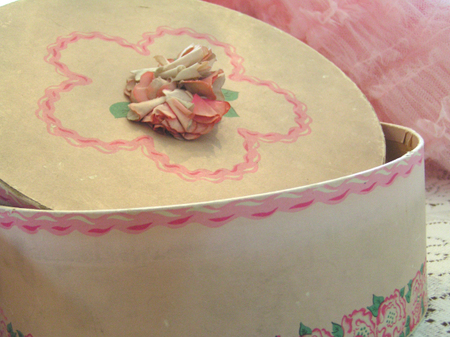 This child-size hat box (above) is one of my favorite finds. The vendor had filled it with old handkerchiefs and wasn't even planning to sell it. I think she was surprised that I was so excited to find it. 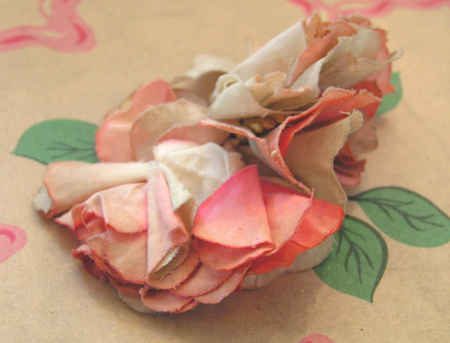 It was only a couple of dollars and the soft cotton blossoms on top are so perfectly tattered. 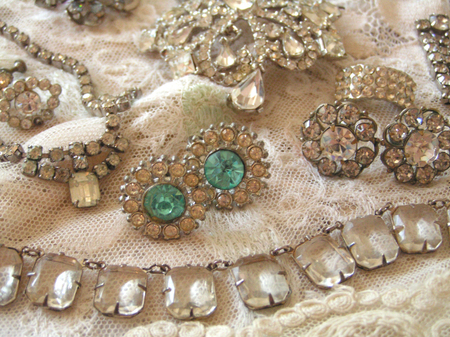 Old jewelry is a big flea market focus for me. Here are some of the pieces I gathered this weekend. I must have found at least 100 pieces, and I was being picky! There is just so much out there if you look in the right places. 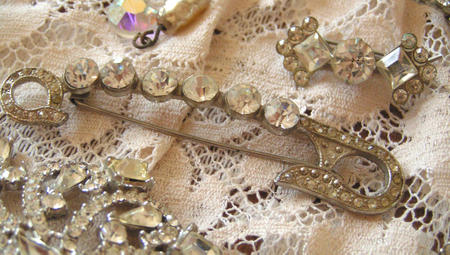 Isn't this rhinestone safety pin wonderful? Some of these pieces will be kept and worn as is, other pieces will be sold in my shop, and still others have a future as part of the jewelry designs I've been working on. Coming soon! I can always use more vintage china with roses. Our kitchen is cream, pink and beige, so I use these things as everyday serving pieces. The more mismatched the better, but they all tie together with the roses motif. I love the silhouette of this $2 footed bowl. 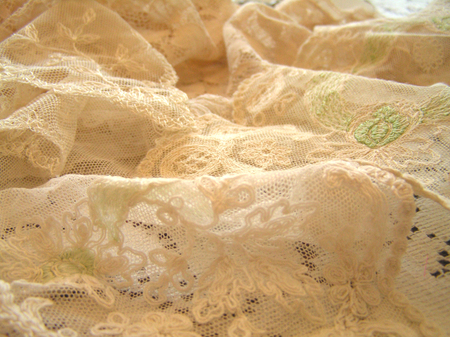 Some old lacy bits to add to my stash. Yum. Well, that's it for now. I'd better get going and unpack the suitcases, clean the house, tackle the laundry and work on the website. The kids will only nap for so long! Patiently (Ok let's be honest impatiently) waiting for the new look and reopening on Thursday!! Love your finds!! You have such an eye for the beautiful!! Blessings and Hugs!! Wow...Can you find the goods or what! Love it all! i can't wait to see the "new" look!! 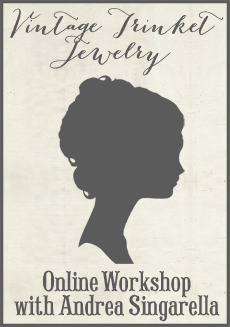 Can't wait to see the new look in your shop!! You found some really great treasures! The jewels are beautiful!!! What beauuuuuuuutiful finds! Those are absolutely gorgeous! 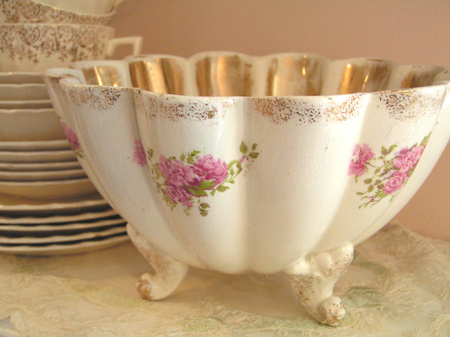 I love that footed bowl! WOW! I am always amazed at the fabulous stuff you find. I must be looking in all the wrong places! Can't wait to see the new look of your shop. I loved the original so can't wait to see what you've come up with! EVERYTING LOOKS SO WONDERFUL. I CANNOT WAIT FOR THURSDAY. I WILL TRY TO PATIENTLY WAIT FOR YOUR GRAND RE-OPENING. I KNOW EVERTHING WILL BE JUST GREAT. Wow! What awesome finds. I never find so much great stuff in one area. I'm beginning to think there just isn't much here in Colorado. Sounds like your niece had a great birthday party!! 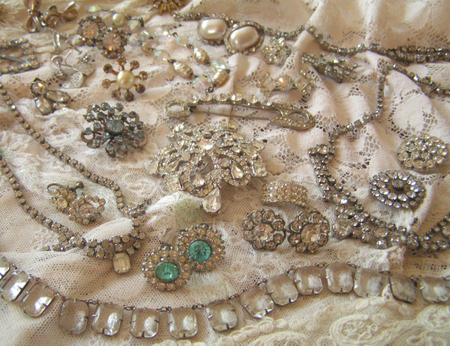 I love all of your flea market finds, especially the rhinestones. that little hatbox and the bling! OH MY! I agree, I must not be looking in the right places! I never find that stuff! Hi Andrea, that rose footed dish is divine and what a bargain!! As for the jewellery...stunning! There is really nothing like that in any markets around here ( Queensland Australia), obviously we were a badly dressed race years ago who didn't know how to accessorise, either that or I am looking in the wrong spots!! THANKS for sharing your finds, can't wait until you re-open, kiss noises Linda Lilly Cottage. oh my gosh! i am so jealous! 100 pieces?! i need to live by you. i don't have access to ANYTHING where i live. what's up with that?! Can't wait until Thursday! Must call my partner in crime so we can drool together! 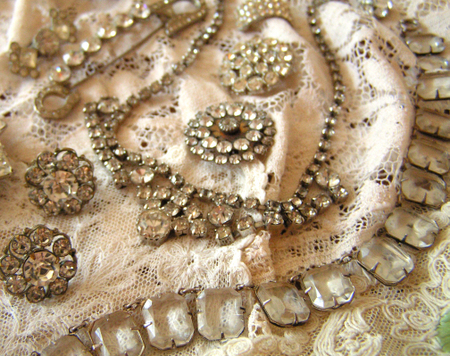 I love all your vintage BLING! Oh you found such a beautiful assortment of goodies Andrea! LOVE the hat box too, and those jewels are exquisite! I love all your pretty finds!! 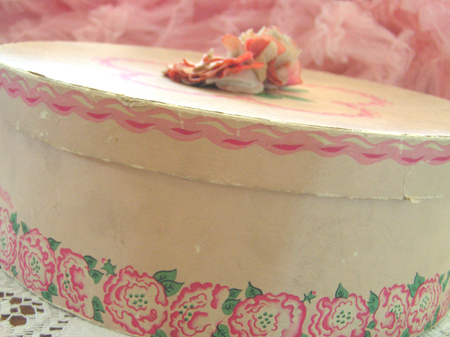 The hat box is SO sweet and the jewelry is making me swoon!! Love the bling andrea! Great find!!! Oh! That little bowl was a steal! I'm crazy about the velvet roses on the purse from the last blog, too. Such soft colors...your eye amazes me!